The Sims 4 for PlayStation 4 is a simulation game that lets you create simulated people, or sims, and place them together in houses in your own little virtual world. The game never plays exactly the same way twice, because every sim has their own motivations, and there's no way to tell how things will end up playing out. If you want to add a whole new dimension of fun to the game, you can use Sims 4 cheats on the PlayStation 4 to alter everything from how much money your sims have in the bank to who they fall in love with. The cheats, tips, tricks, and hacks in this article specifically apply to the Playstation 4 version of Sims 4. You may find Sim 4 cheat codes for Xbox One or Sims 4 cheat codes for PC more useful if you're using one of those platforms. How Do Cheats Work in The Sims 4 on PS 4? Cheats in The Sims 4 on PlayStation 4 can drastically alter your gameplay experience. They can make your life easier by providing a bunch of free money, allow you to alter aspects of your sims, create and destroy relationships, and make it a whole lot easier to build the house of your dreams. Cheats can even do funny things, like turn a sim's head into a toilet. You're free to use as many cheats, whenever you want, but it's important to note that enabling cheats disables your ability to earn trophies. Trophies are disabled on a per-save basis, so if you want to start earning them again, just create a new game or load a save where you never enabled cheats. Maxis intentionally allows players to use cheats in The Sims 4 on PlayStation 4, so using them won't get you in any trouble. These cheats are often broken by game updates though, and Maxis can also turn any cheat off at any time. For example, a game update broke ghost and death cheats. If you find that a cheat doesn't work, and you're sure you entered it right, all you can do is wait to see if Maxis ever fixes it through a later update. Cheats are enabled in The Sims 4 on PlayStation 4 by opening the cheat console and entering the testingcheats true command. This is accomplished by pressing a combinations of keys on your keyboard in the PC version of the game, but in the PlayStation 4 version you can access the cheat console by pressing a combination of buttons on your DualShock 4 controller instead. Press and hold L1 + R1 + L2 + R2 (all four shoulder buttons) on your controller. Press the X button on your controller to select the cheat console. When this process is completed successfully, you will see a message in the cheat console that says cheats are enabled. You can then enter any cheats you like into the cheat console. If the cheat console disappears, just press and hold L1 + R1 + L2 + R2 on your controller to open it back up. Tip: Some cheats are enabled with the on or true after the cheat code. These cheats can be disabled by using the same cheat code but typing off or false instead. You need a lot of cash, otherwise known as Simoleons, to get anything done in The Sims 4. You can get it the old fashioned way, by putting your sims to work, or use these money cheats for a quick cash injection or to make yourself a millionaire. Changes the total amount of money you have to the number you enter. Type money into the cheat console, followed by the amount you want. When entered from the neighborhood view, all of the houses and lots are made available for free. Type FreeRealEstate on into the cheat console. The build mode in The Sims 4 on PlayStation 4 allows you to alter your house, buy and place furnishings, and even build totally new houses that are bound only by your imagination. If you want to get the most out of this system, and remove all limitations, we have some pretty powerful build mode cheats that can change the rules that govern the placement of items, unlock new items, and even let you change the size of various objects. Gets rid of object placement rules so that you can place things closer together or even overlap them. Type bb.moveobjects into the cheat console. Instantly unlocks all of the furnishings you would normally have to unlock by playing the game. Type bb.ignoregameplayunlocksentitlement into the cheat console. Activates the the buy debug mode, which allows you to buy additional items that aren't normally available. Type bb.showhiddenobjects into the cheat console. Increases the size of an object. Select an object, hold L2 + R2, and then press up on the d-pad. Decreases the size of an object. Select an object, hold L2 + R2, and then press down on the d-pad. In The Sims 4 on PlayStation 4, individual sims have two different relationship stats that measure their feelings toward other sims. One of these stats determines if two sims are friends, and the other determines if they are romantically involved. These stats will change over time through normal gameplay, or you can use relationship cheats to instantly make two sims best friends or enemies. If you entered that exact code into the cheat console, it would provide a nice friendship level boost between the sims Kaz Hirai and Shuhei Yoshida. If you use a negative number instead, you can create a negative effect on the friendship of the two sims instead. Introduces the selected sim to all of the other sims in the neighborhood. Type relationship.introduce_sim_to_all_others into the cheat console. Causes a new sim to spawn on your lot and become friends with the selected sim. Type relationship.create_friends_for_sim into the cheat console. Sims in The Sims 4 on PlayStation 4 all have their own skills, which they can improve over time through practice. If you're tired of waiting, you can use cheat codes to instantly boost, or even max out, any skill you like. All cheat codes that modify skill levels in The Sims 4 on PlayStation 4 follow this format: stats.set_skill_level SkillName 10. That is, you use the stats.set_skill_level command, followed by a skill name, and then a number. The Sims 4 on PlayStation 4 has a number of expansions that add totally new skills to the game. If you have the expansions, you can use the following codes to alter the skill level of any of your sims. These codes are used the same way as the codes in the previous section. If you entered that exact code into the cheat console, your currently selected sim would be immediately bumped up to a media production skill level of 10. However, it will only work if you have The Sims 4 Get Famous expansion. If you don't have the expansion that introduced a particular skill, using the code for that skill just won't work. 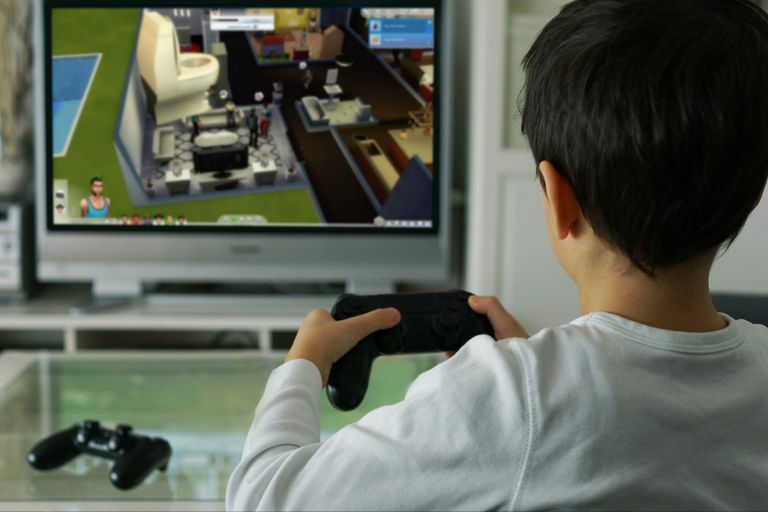 Children in The Sims 4 for PlayStation 4 have their own basic skills, which they need to build and improve upon before they become teenagers. These skills can be altered and boosted the same way as adult skills, using the same basic command. All cheat codes that modify a child's skill levels in The Sims 4 on PlayStation 4 follow this format: stats.set_skill_level SkillName 10. That is, you use the stats.set_skill_level command, followed by a skill name, and then a number. Toddlers in The Sims 4 on PlayStation 4 have their own set of skills that are similar to, but distinct from, child skills. When a toddler sim grows to become a child, they get boosts in each child skill based on how high you were able to get their toddler skills. If you want to make sure your kids get the best head start possible, you can boost their toddler skills using the same kind of commands that boost both child and adult skills. Note: Most toddler skills max out at 5, unlike child and adult skills. The exception is potty training, which tops out at just 3 instead of 5. Gives the selected sim a promotion in the career of your choice. Type careers.promote into the cheat console, followed by the name of a career, e.g. careers.promote painter. Adds the career of your choice to the selected sim. Type careers.add_career into the cheat console, followed by the name of a career, e.g. add_career entertainer. Removes the specified career from the selected sim. Type careers.remove_career, followed by the name of a career, e.g. careers.remove_career astronaut. Just like real life, teen sims have limited job prospects. In fact, teen sims can't hold any of the jobs that your adult sims have available. Instead, there's a smaller set of jobs that are exclusively available to teen sims. Like adult careers, you can use cheat codes to alter your teen sims jobs. If you entered that exact code into the cheat console, the selected teen sim would get a new job in the fast-paced world of the fast food industry. Most cheats in The Sims 4 on PlayStation 4 are turned on and off through text commands that you enter into the cheat console. Once you turn cheats on using the testingcheats true command, you also unlock some powerful cheats that can only be accessed through contextual menus. To use these special cheats in the PC version of the game, you need to hold shift when you click on a sim or object to access the special cheat menu. That isn't possible on PlayStation 4 if you don't have a mouse and keyboard connected, so you also have the option to move the selection cursor over a sim or object and then press and hold the O button before pressing the X button to access this menu. With the menu open, you can select any of the available cheats to activate them. Press and hold the O button on your controller. Press the X button on your controller. Opens the Create a Sim interface, which allows you to totally modify any sim to your liking, even after you've started playing. Note: This cheat requires you to first enter cas.fulleditmode into the cheat console. Sim Reset Object Resets the currently selected sim. Use this cheat if any of your sims become glitched. Sim Cheat Need Allows you to fill the needs of any sim, or disable need decay. Sim Marriage Allows you to end marriages. Mailbox Alter Need Lets you fill or alter the needs of the entire neighborhood, or just your household. Dirty object Make Clean Cleans the object. Only works on objects that can be dirty. Clean object Make Dirty Makes the object dirty. Only works on objects that can be dirty. The ground Teleport Here Instantaneously Teleport the sim that you currently have selected to the specified location.